"Best Knife I have ever owned"
15 Feb 2019, Tim M.
Comfort, sharpness and durability. I steel it regularly but it now needs to be professionally sharpened, I have had it for around 5 years and this is the first time I have needed to have it sharpened. It's still much better than your average budget kitchen knife but when sharp its a revelation! I'm sure there are better knives out there for a price but this more than suits my needs as an enthusiastic home cook. unless you lose it, it should last you a life time. "Full set of Global Knives"
30 Jun 2018, Doug L.
These are all high quality stainless steel Japanese knives. Being Japanese they are thinner than European knives. As far as Japanese knives go - the Globals are of medium quality. But compared to most other knives they are superb. The blades are sharp from new and the metal handle gives a good grip. They need to be sharpened on Japanese Water stones, and finished on a leather strop loaded with diamond paste, by someone who specialises in sharpening. I do this myself, and the blades take an extremely fine razor sharp edge. Regular use of ceramic rod to re align edge advised. Excellent knives, but at this price you would be advised to check out other high quality Japanese knives. Try JCK direct from Japan for a huge selection of superb knives. "Global Kife Set (Including G2)"
03 Dec 2017, Lisa R.
Good knives that you can keep very sharp , but do require regular honing. I sharpen all of my Global knives immediately before use and again after cleaning and before racking. We don't find rusting an issue. Yep, brittle edges. Despite careful use and storage the edges nick quite easily. Don't store these knives on magnetic wall strips as a friend of mine does, they snap onto the strip with enough force to put small nicks in the blade. We store our Global knives either vertically or spine down (not blade down) in a knife block. "The whole set of knifes"
09 Jan 2017, David H.
Due to Iron content they rust easy so don't put them away in the knife block straight away after drying them, leave out for a while other wist the moisture goes into the wooden block and comes out making them more rusty. 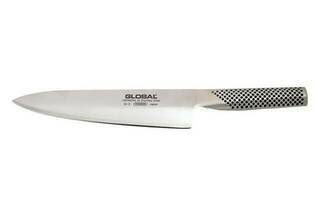 03 Jan 2017, Helen P.
"Global kitchen knives - the full set"
07 May 2016, Sarah W.
Although not cheap, they are worth the money and are very durable.My set is about 15 years and they are still as good as new. In spite advice given by your test team to avoid pull through sharpeners I use the one sold by the Global knife company and find it excellent; the loss of metal has been imperceptible. I also use their block for keeping the knives safe. Not everyone likes the balance of the larger knives and I would recommend trying them, together with other brands for comparison before buying - at these prices you would want to be certain they suited you. They are not dishwasher-proof and that can be a nuisance but worth the minor inconvenience. If you do put them in the dishwasher, they will become dull in both appearance and, eventually, sharpness. This dullness in appearance is eventually cured by careful hand washing, and sharpening takes care of the edge.